Group Affiliation: Agent of S.H.I.R.T.S. A highly trained combatant, Bombshell is skilled with explosives, both building and delivering, and she’s skilled using them as missiles, tossing a cigarette bomb down the exhaust pipe of a car from the back of a moving vehicle. Unhappy with her life, and having been thrown out by her parents, teenager Phyllis Tanner tried to take her own life by jumping off one of the World Trade Center towers in New York, but was stopped short when she landed on the invisible headquarters of S.H.I.R.T.S. (Secret Headquarters, International Reconnaissance, Tactics and Spies), which was based between the top of the two towers. Recruited into, and trained by, S.H.I.R.T.S., her first mission saw her teaming up with Spygirl, an agent of M.A.N.G.A. (Middle Asian Network of Global Activities), but it ended with Spygirl abandoning Bombshell when it became necessary for the successful completion of the mission. Bombshell escaped on her own, but developed an enmity for Spygirl. When S.H.I.R.T.S. learned the location of the fugitive Moore family, former spies who’d fled to protect young Alex, who’d been imprinted with the Spyboy persona, Bombshell was sent to carry out surveillance, and to protect him when agents of S.K.I.N.S. (Supreme Killing INStitute) located him. 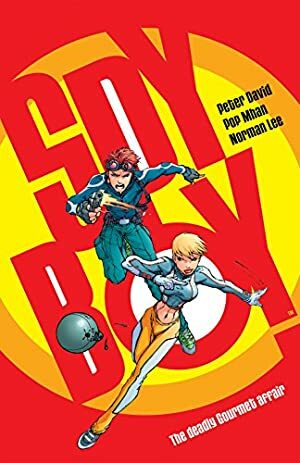 The Spyboy persona was activated, and Alex was recruited into S.H.I.R.T.S.. Bombshell was assigned by Prime Number, head of S.H.I.R.T.S., to be his partner, and forced to attend his high school under the name Marta Hari. Despite her irritation at Alex’s amateurishness, and Spyboy’s unwillingness to work with others, she began to develop feelings for Alex. While tangling with the Palindrome assassin organization, Bombshell was captured and handed over to Hindasti slavers, ending up in an auction run by Slackjaw. Alex rescued her, and they fled, landing in Japan, where she again came into contact with Spygirl, to her dismay. Bombshell’s irritation continued when Spygirl was also sent to join the crew in high school. Falling into the hands of Madam Imadam’s Palindrome again, Bombshell was brainwashed by Dreamboat into believing over a decade had passed, and that Spyboy had gone rogue. Dispatched to kill him, she failed, and was eventually broken free from the delusion when Alex kissed her. She was shortly thereafter reunited with her parents, whom Prime Number had been in contact with since her recruitment. Bombshell continues to work with Spyboy for S.H.I.R.T.S.. Aggressive and assertive, Bombshell is short with those who don’t seem to know what they’re doing, or with those who don’t take her seriously. Devoted to her job, she doesn’t understand why she has to be a part of Spyboy’s double life, wasting time that could be used for missions. Her confidence at her job doesn’t extend to social situations, during which she usually gets defensive, having trouble trusting people, and while she seems to be attracted to Alex, her low self-esteem means she doesn’t see why he would be interested in her. She prefers to be self-reliant, and is very slow to make friends. Bombshell is usually armed with an array of bombs, either regular explosives (Bomb 02-08 APs) or smoke bombs (Fog 02-04 APs), which may be set on timers. She also keeps a blasting cap as a false tooth. Writeup completed on the 1st of December, 2009.